Ahead of its eighth season premiere on HBO, “Game of Thrones” will become the centerpiece of a new marketing campaign that shows the growing synergy of AT&T. On April 1, AT&T flagship stores in four cities will be transformed into “GOT” emporiums, with authentic costumes from the various “houses” and allies in the series. So Chicago’s store will be House Stark, New York will be Lannister, San Francisco will be Targaryen and Boston wlll be a mash-up of Targaryen vs Lannister. The stores will also feature what AT&T calls “limited-reveal video content” from the new season that begins on AT&T-owned HBO on April 14, and digital games and VR/AR experiences. At all of those stores except the one in New York, AT&T is also showcasing the introduction of the Magic Leap One virtual retinal display virtual reality goggles. On different days in Boston, Chicago and San Francisco, visitors will be able to play “The Dead Must Die,” a Magic Leap encounter that lets brave consumers confront a “Game of Thrones” enemy, the White Walker. “With torch in hand, visitors become soldiers in a standoff, as a frozen portal reveals the deadly world beyond the wall,” reads AT&T’s description of VR scene. “It’s scary to see a White Walker, but it’s much scarier when it sees you.” If you want to buy a pair of the new Magic Leap One goggles, it will set you back $2,295. At a lower price point, AT&T stores and its website are also stocking up on "GOT" paraphernalia, from smartphone cases and wireless chargers to wine tumblers and water bottles. 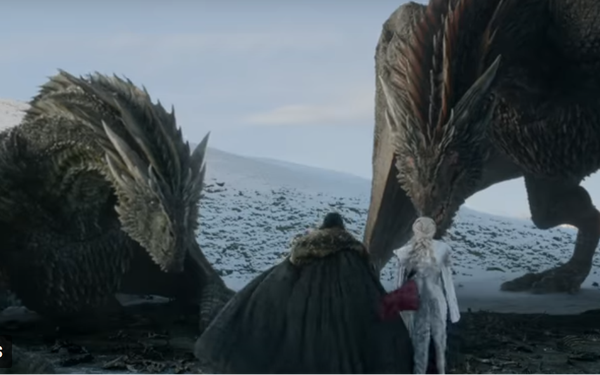 Back in 2017, 16 million people saw the season seven “GOT” finale. So fans have had a long time to catch up before the eighth and final season unfolds in six episodes. Over at DirecTV, also owned by AT&T, the satellite TV service has created the “Game of Thrones” Challenge 1, a set-top app that quizzes viewers on the series. You don’t have to have HBO to play it, but you do need DirecTV. The AT&T marketing push extends to the NCAA basketball tournament final four in Minneapolis, where, among other things, fans can visit re-creations of the Throne Room and Fire & Ice Room for a photo op. Likewise, on an AT&T’s Thanks app that ordinarily gives wireless subscribers deals and perks, someone is going to win an authentic Iron Throne, just like the one in the series.